Every Sunday we have coffee and snacks in the hallway we call "The Link". In the summertime we serve lemonade and snacks outside. We need people to set up the coffee or lemonade and provide cookies or another type of snack. There is a sign up sheet above the coffee station in the link so you can sign up any time you think you'd like to do it. 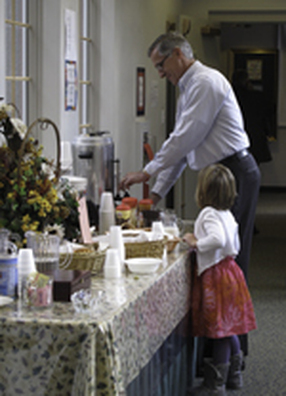 We could also use more helpers on the Coffee Clean-Up Crew to put everything away after the service on Sundays.